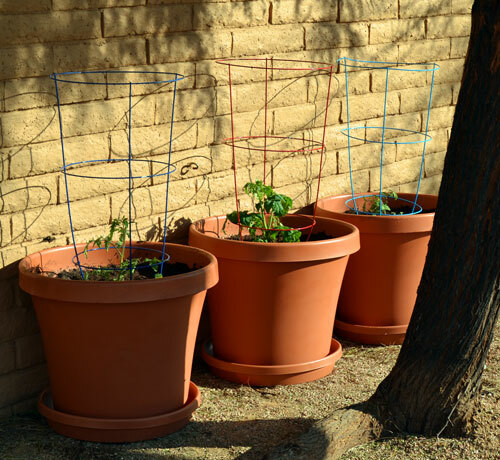 Gardening in the desert, where every plant is made to survive and has the thorns to prove it! If you are ever at The Hacienda, you will be sure to hear that. And if you are ever wondering where I am, there’s a good chance the answer is the same. 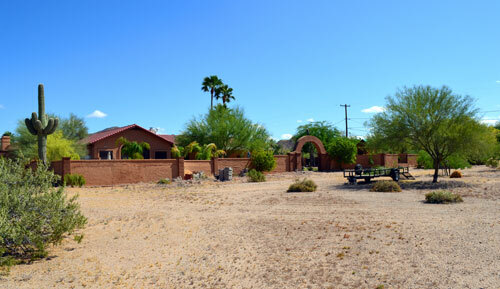 Welcome out-back at the Hacienda. So happy you stopped by! If I could, I would hand you a cold drink and invite you to find a shady spot and “sit a spell” as the saying goes. 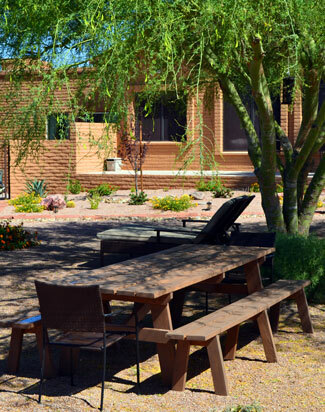 Perhaps my favorite spot at the picnic table under the Palo Verde tree? Out-back has not always been the most welcoming or inviting place to be though. We started with a blank slate. 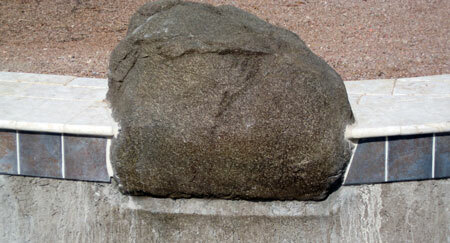 Actually, I wish we had started with a blank slate, it took a whole lot of work to get to the blank slate stage. 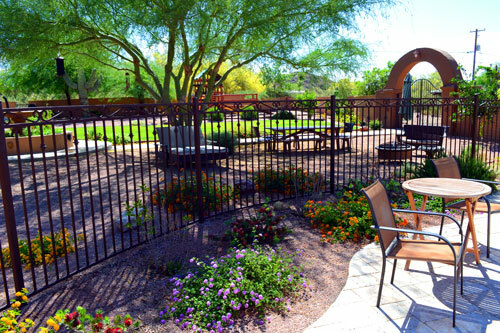 This is the somewhat dismal view from the back patio looking toward the back gate. The only thing I saw was potential. My husband, on the other hand, saw the endless work ahead. We were both right. I sure wish I had taken photos before we had done anything (this wasn’t my first reno so you’d think I’d know better). Before we started, you couldn’t even see the fountain from the back door. The Palo Verde branches were hanging down all over the ground and covering it along with many more Creosote bushes and other wild desert plants. What you see above is after the work of a determined husband with a new chainsaw. What you see below is the same view as it looks today, a little less dismal, after a bit of vision and a whole lot of hard work. 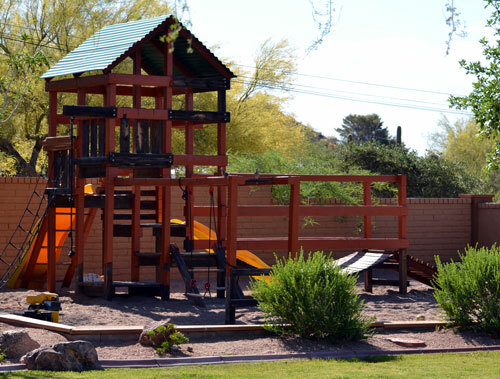 The play set in the giant sand pit was a pretty big mess of splintered wood and rotting stairs and ramps. The previous owner had wrapped a lot of the wood in plastic PVC tape to add a protective layer and prevent splinters (I’m guessing). Sadly, the black PVC tape was ugly – really ugly – and had white lettering all over it. Lovely. That was done by a guy, I guarantee it! Loads and loads of potential. 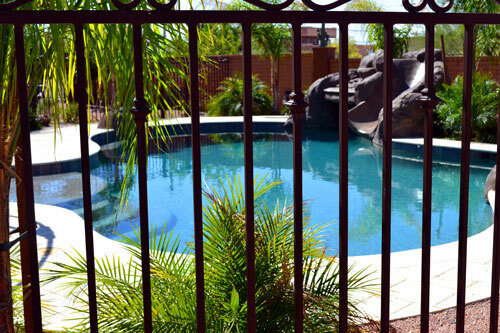 Now doesn’t that look like the perfect place to put a swimming pool? With kids and a dog, you have to have a little grass! We did hire out a few things. A guy with a small excavator was a life saver. 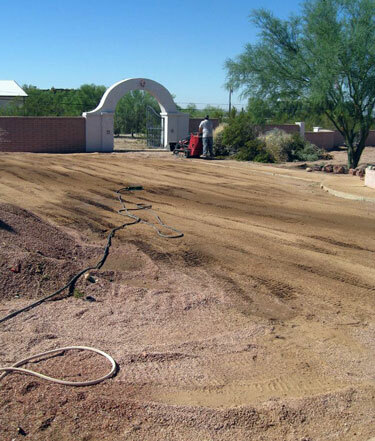 And the lawn curbing was best left to the professionals. 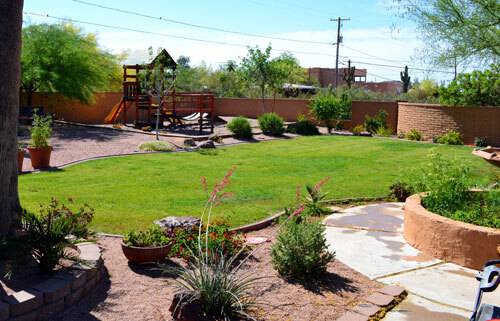 My husband LOVES the natural “organic” shape I designed – it is just so easy to mow. Not really. But it’s pretty. The grass looks a little it rough right now as the winter grass is starting to die off as it gets warmer and the Bermuda Grass, which goes dormant in the winter, begins to wake-up and take over. 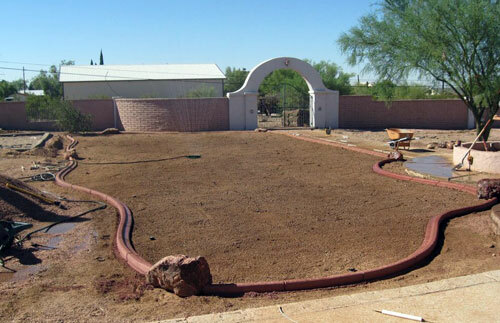 Yes, in Arizona, you have to plant new winter grass E.V.E.R.Y. winter. 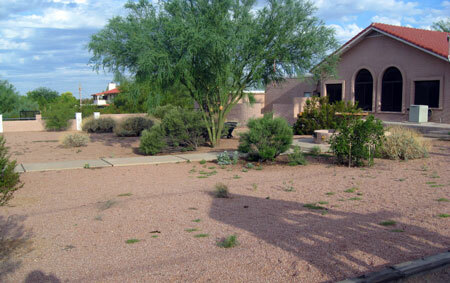 I really do love how the “grass” side of the yard turned out. We won’t speak of the crying that occurred during the sod laying phase. Let’s just say our timeline got away from us and my husband could no longer put off heading to the airport for out of town business. 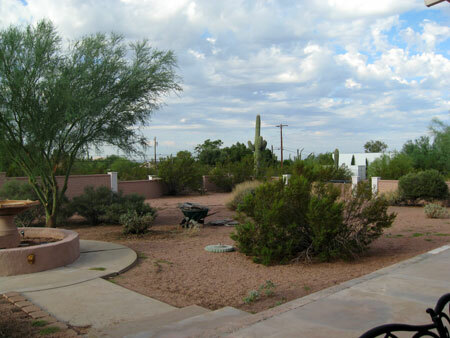 One third of the yard was left to do, light was fading, the sod was soppy and heavy and stinky and had to be finished, the dog had tangled with a cholla cactus, the kids were hungry and fighting, I was dirty and soppy and stinky (see reference to sod). There were tears. But the dog lived. And the kids ate. And I finished. And took a shower. Before we move on to the rest of the yard, I have to tell you what I did with the ugly play set. Gary fixed all of the rickety and dangerous parts and put on a roof for shade and then I painted the PVC tape. There was no taking it off so I bought about 438 cans (or so) of spray paint – the kind that adheres to plastic – and painted over all of that crazy tape. It is a lovely cinnamon color. I was a lovely cinnamon color. It won’t win any design awards but it sure looks better. Actually, I think it looks kind of cool. Speaking of cool, how about that nice shady spot? The lounge chair was my husband’s Father’s Day present last year. Would you like to see my Mother’s Day present from last year? But before you go turning my husband in to the “worst Mother’s Day present ever” police, this is what I asked for. I’m not a jewelry girl. 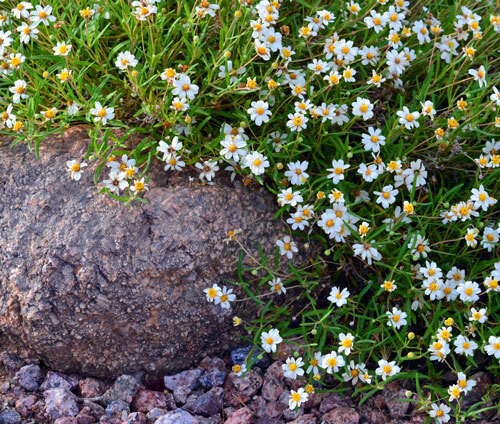 When I say I want “rocks”, this is what I mean. 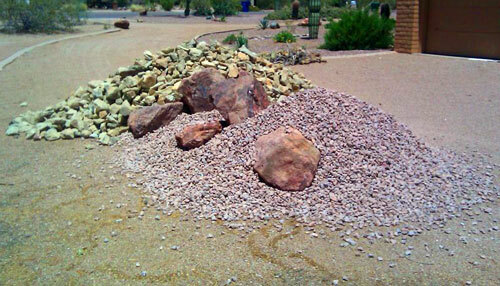 Besides, they came with a labor agreement from the sweet man who got me a big pile of rocks for Mother’s Day. The picnic table was not comfortable. So, I ordered a chaise. 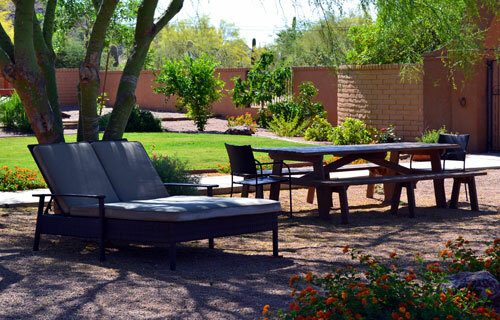 It’s a nice spot for a siesta. It was so nice of me to think of him. Moving on. 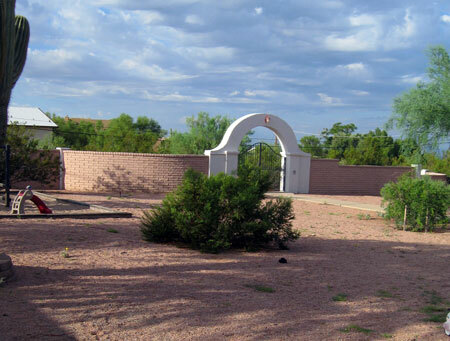 Remember this side of the yard? Didn’t I tell you it was a nice place for a pool? Those are some of my rocks. The pool. The pool. The pool. That is a subject for another post. Let me just say, putting in a pool is not something I want to do again anytime soon. “Monica” plans and supervises pool construction. Remember her? She has meltdowns over un-authorized white grout in her otherwise “natural” color scheme. The grout didn’t stay white. Monica had them fix it. In the end, it really was well worth all the headache (and bank account ache) because it was all about the kids and they LOVE it! Actually, we all love it. I just love it a little warmer than they do. So that is our back yard. Out-back. But there is also a “Waaaaay Out-back”. Just through the back gate. 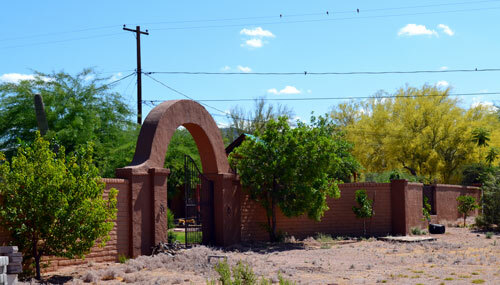 (That is my peach tree in the foreground, a Brazilian Pepper to the right of the gate and the three tiny trees along the wall are a mandarin orange, ruby red grapefruit and a Eureka lemon – inside the fence I have two limes, an orange, a Meyer lemon and a fig tree). 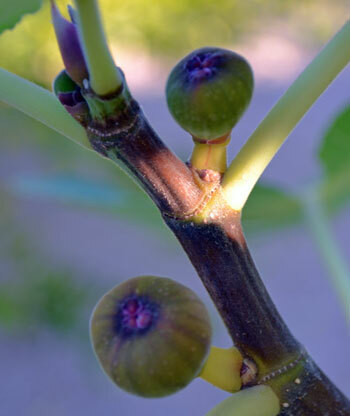 Love my fruit trees. The way out-back remains open for possibilities. There is talk of a basketball court and a chipping green. But I think it is the perfect spot for a small commercial kitchen for recipe testing and catering. What? It would be small. And a business. And there would still be room for sports. Barefoot Contessa has a barn. Barefoot Contessa can afford a barn. Oh well, a girl can dream. For now, I’ll just be happy with another big pile of rocks. Thanks for joining me out-back this afternoon. Come back, you are always welcome. 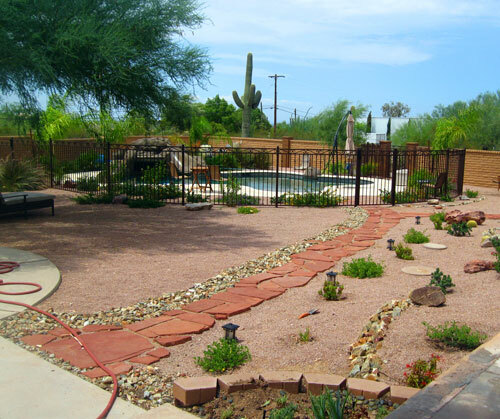 This entry was posted in Life in the Sonoran Desert, Making a House a Home, Welcome Company, Welcome to my Garden, Welcome to my Hacienda, Workin' the Land and tagged Backyard, Desperate Landscape, Gardening, Landscaping, Nature, outdoors, Outside, plants, Remodeling, Renovating, Swimming Pool on May 10, 2013 by Welcome Company with Danielle. Yesterday, we did our best the celebrate Cinco de Mayo or as my sweet friend who made a pinata out of a paper gift bag and hung it over her railing for her kids tagged it, #gringodemayo. She is one of the funniest people I know. Maybe next weekend I’ll get a Mother’s Day Blackberry Margarita?! While it was a busy weekend, it was a beautiful spring weekend, moderate and breezy and so enjoyable. 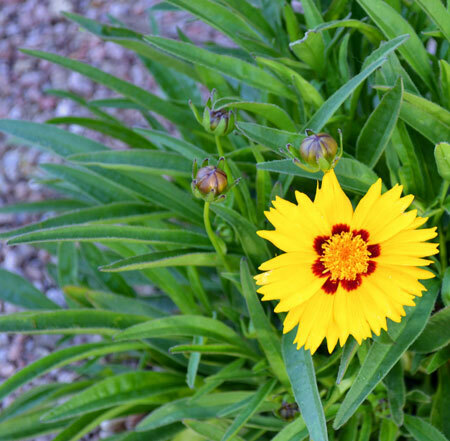 We are just on the verge of the summer heat and many of the spring blooms are beginning to fade. 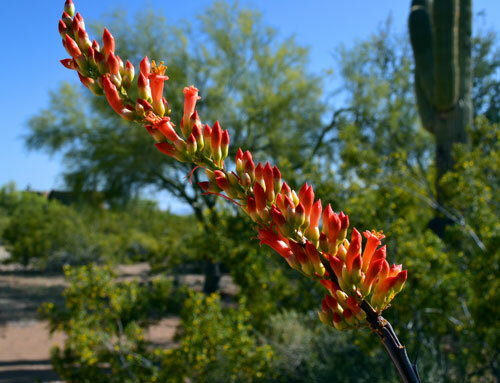 So, I think it is about time I share with you a little of the beauty of the Sonoran Desert as it comes to life with color each spring. 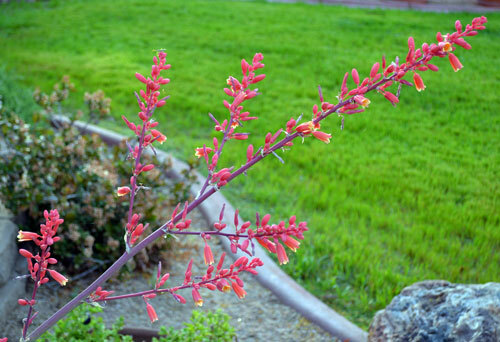 The Ocotillo is one of my favorite desert plants. 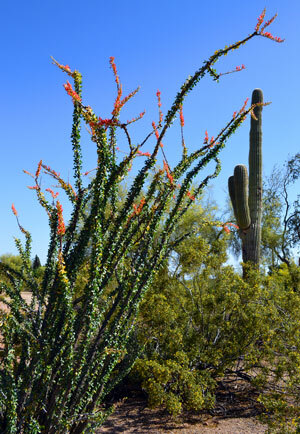 I love the architecture of its long thin spines and the beauty of the orange tufts that appear at their tips each spring. 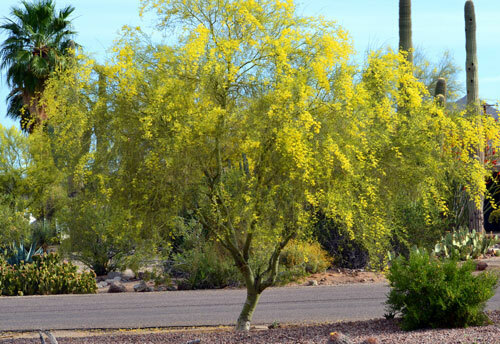 We are on 2.2 acres and have more Palo Verde trees than I can count. Well, I probably can count them I’ve just never actually had the inclination to do so. What I can tell you is that in the spring, our property is ablaze in the beautiful yellow blossoms that cover these gorgeous trees. 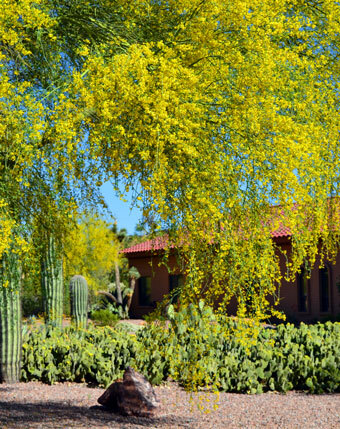 Palo Verde means “green stick” which characterizes the deep green trunk and branches of the tree. 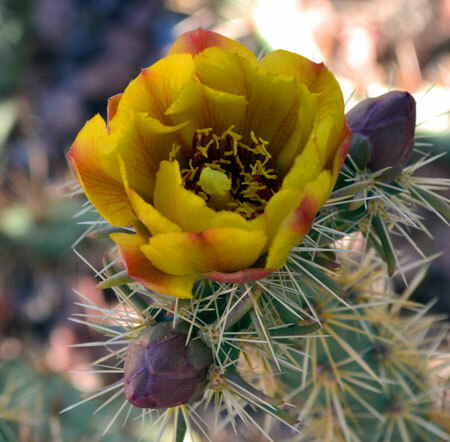 The Staghorn Cholla produces some of the most beautiful blooms in the desert. I think they look a bit like wild roses. 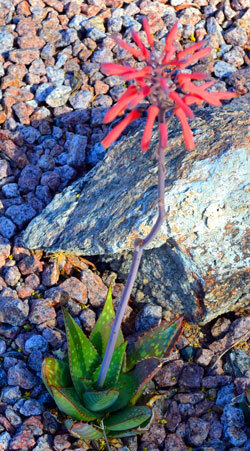 I love the contrast of something so lovely and delicate coming from a plant that is so harsh and hostile. Hostile? Very. 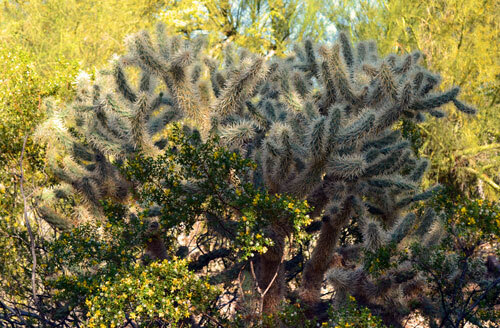 Cholla are pretty vicious plants, particularly Teddy Bear Cholla like this one. 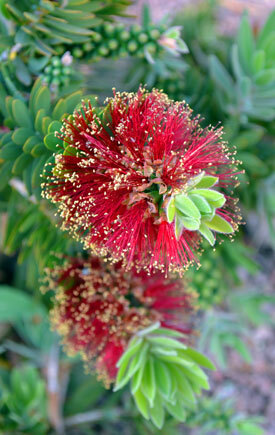 An ironic name as this is not a cute and cuddly plant. 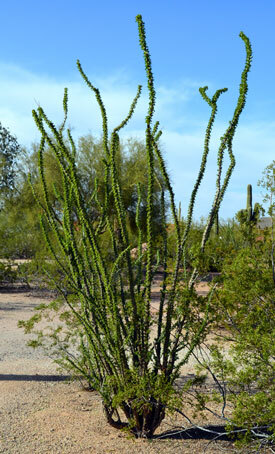 The thousands of barbed spines give it an almost “fuzzy” appearance, hence the name “Teddy Bear” Cholla. 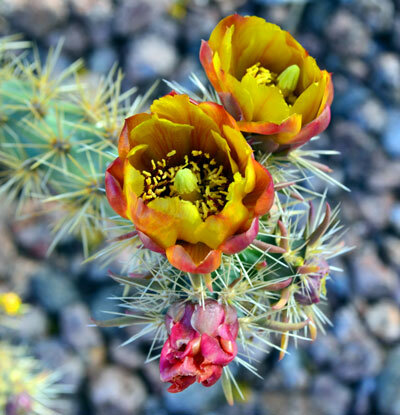 They are also called “Jumping” Cholla as sections of the plant almost seem to jump at you as they get drier and lighter in order to be picked up in the wind and seed. 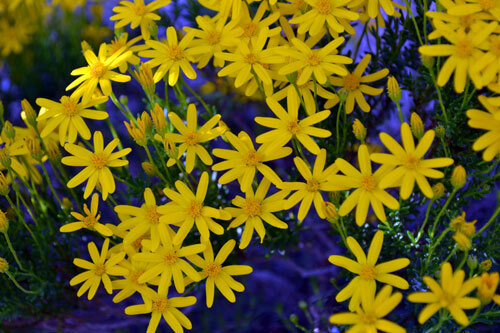 They are beautiful but they are not a plant to be tangled with. Literally. Those spines are painful and we’ve had a few run-ins prompting us to remove many of them from the property. 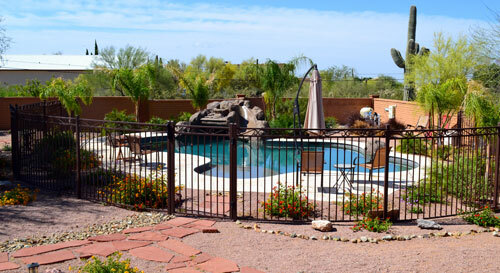 This one sits right over the eastern wall of the backyard where it doesn’t cause any trouble. 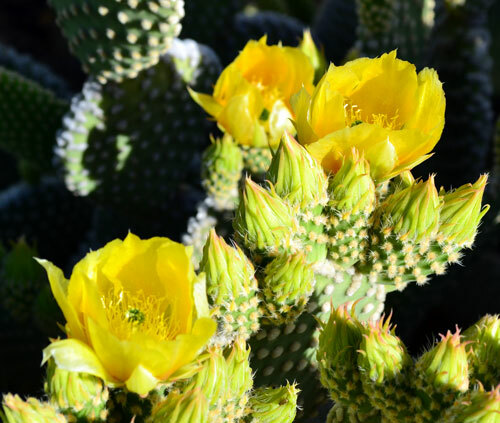 Another cactus that we have in abundance is the Prickly Pear. 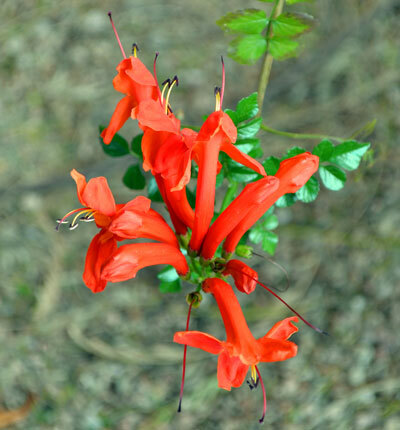 There are many varieties with different colors of blooms and pads. 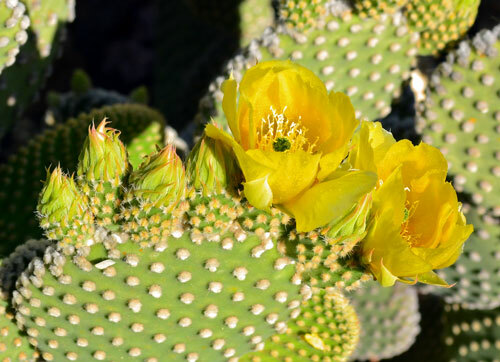 Soon the blossoms will be replaced with an edible Prickly Pear Fruit. 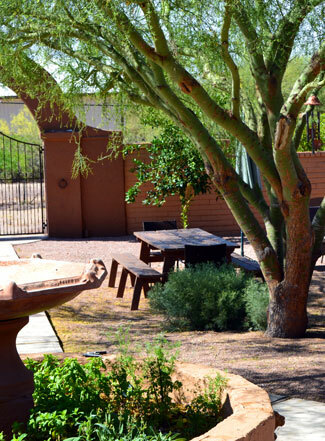 I haven’t used the fruit yet but maybe this year, you’ll see a few “Prickly Pear” recipes here at Welcome Company. 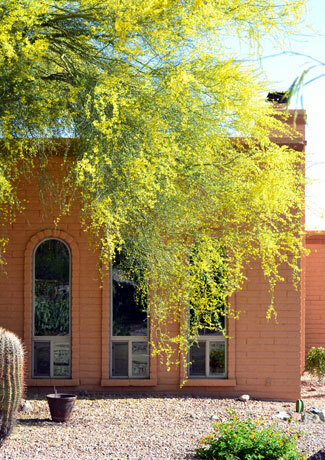 We have a little garden of this particular variety with its delicate yellow blossoms (which I think is the New Mexico prickly pear), right outside the front door. We trim and manage our own landscape which means several trips to the dump each year where they recycle the yard wast into mulch. On one of our dump runs, I rescued about 15 of these little aloe plants that had been thinned out and discarded (probably by the same landscapers that hurriedly mow down with hedge trimmers prune all of the neighborhood and commercial landscaping into unnatural geometric shapes leaving it looking like a horrible martian landscape – I’ll do my landscaping myself thank you). I guess bringing something home from the dump technically makes me a “picker” but I couldn’t just leave them there. They have recovered well and look great! 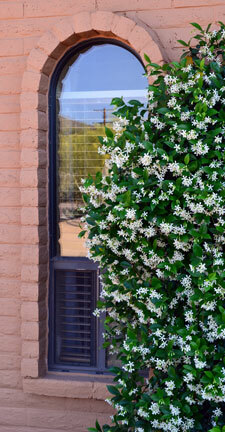 One of my favorite things about spring is the Jasmine that grows right outside the living room windows. 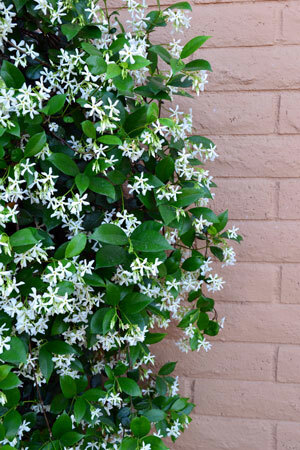 After dinner when we are sitting down watching some TV or reading, the heavenly scent of the jasmine blossoms floats in through the open windows and perfumes the evening. 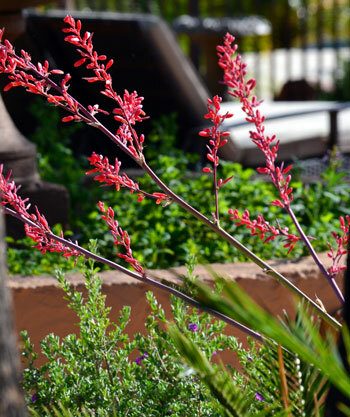 The blossoms of the Red Yucca are long-lasting and attract humming birds which we love to sit and watch from the back porch. 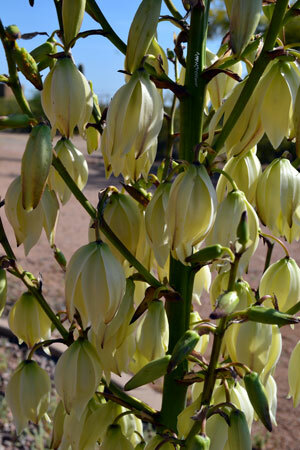 But the delicate white bell-shaped blossoms of the Blue Yucca are short-lived. I wish they lasted longer but I look forward to their return each spring. 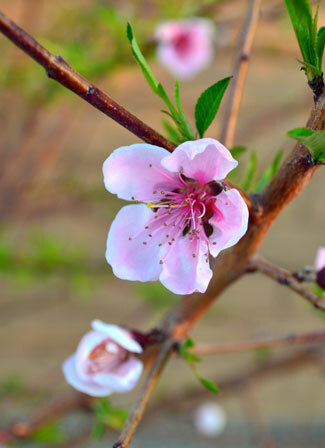 In fact, most of the blossoms I’ve shared with you don’t last much beyond the spring. 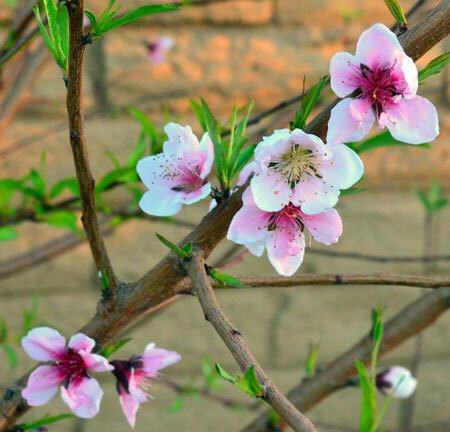 Which is part of what makes spring so special. 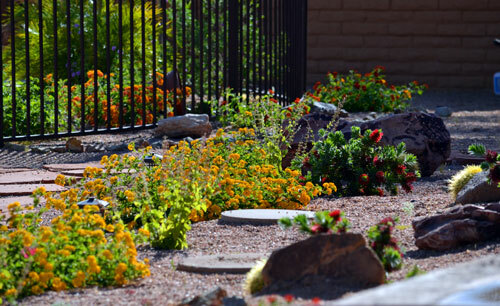 Luckily, we are blessed to have many plants in our desert landscape that provide us with beautiful color throughout the year. 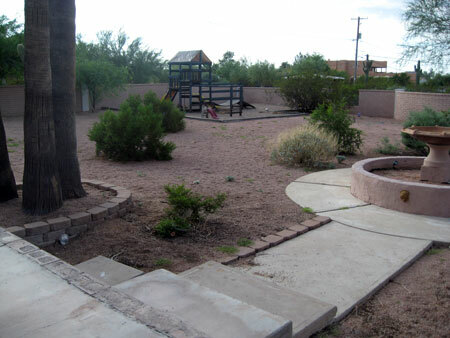 When we moved out here nearly three years ago, the back yard was a wasteland and the landscape neglected and out of control. We have worked hard and it has been one of my greatest joys to care for it and watch it come to life. I’ll share a little more of that journey with you this week. A few days ago, I was sitting at my desk working on a post and looked up, spotting this guy through the french door window. I raced for my camera, switched the lens and somehow managed to get these two shots of him. 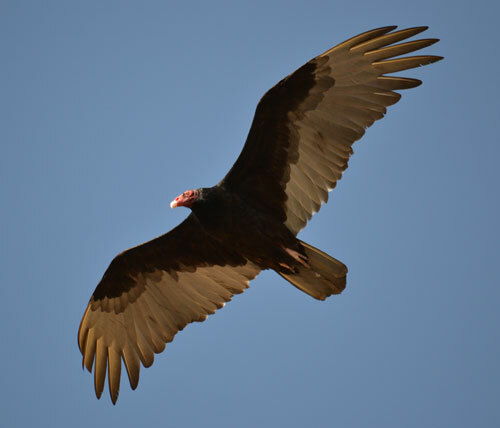 When I saw him through the door, I thought he was a hawk but he turned out to be a huge Turkey Vulture. Pretty Incredible place we live in. 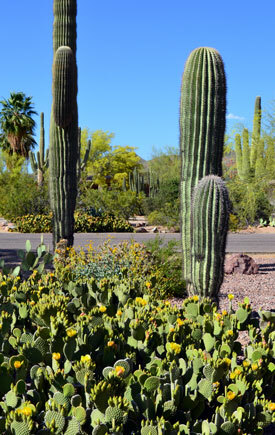 The Saguaros are just starting to sprout the beautifully unique flowers that will soon crown the tops of their bodies and arms. I can hardly wait to share those photos with you. And keep checking in because one of these days I’ll get that hawk picture I’m after! 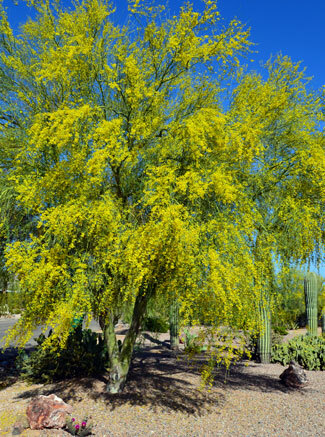 This entry was posted in Life in the Sonoran Desert, Photography, Welcome Company, Welcome to my Garden, Welcome to my Hacienda, Workin' the Land and tagged Cactus, cholla, Gardening, Nature Photography, naturre, palo verde trees, Photography, prickly pear, Sonoran Desert, Spring Flowers, Succulents, Turkey Vulture, wildlife photography, yucca on May 6, 2013 by Welcome Company with Danielle. I think, finally, I can say that it is officially Spring around here. Finally. It is a little cold and rainy again this morning but I am going to stick with the idea that it is indeed, Spring. I know, I know, if you are back east, in the midwest or up north, you don’t want to hear a southwestern girl complaining about the cold – especially today with yet another winter storm blowing in. 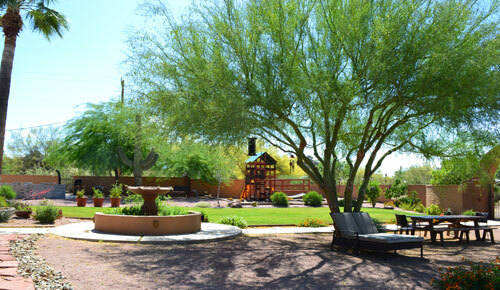 I used to live with snowy long winters too but I have been in Arizona for a long time now and my blood has become very thin. VERY thin. I could never go back, I wouldn’t survive a real winter. 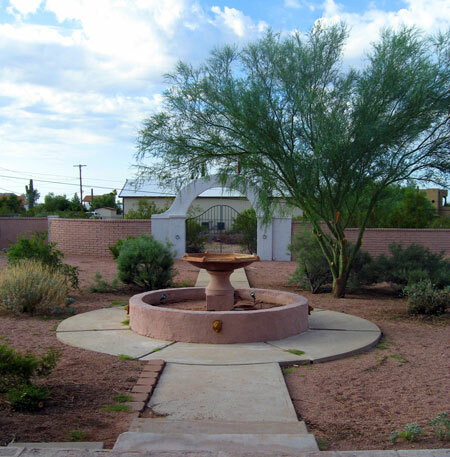 Even here, we have had an unusually cold winter with several nights of record below freezing temperatures – not fun for desert plants or desert gardeners. There were a few mornings of taking kids to school in 20 degree temps that I was sure I wasn’t going to make it. Heated seats are the only thing that saved me. But it has been warming up and for about a month now, I have been crazy to get outside and get my hands in the dirt and on the pruners. 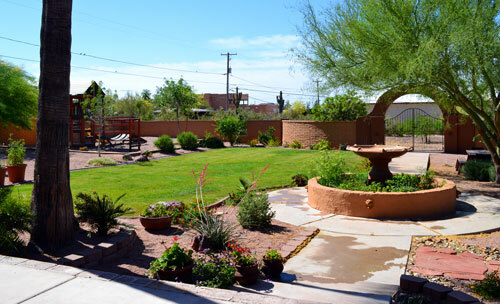 We live on just over two acres of Sonoran Desert and I have fallen in love with cultivating this harsh but beautiful land. One day soon, I will tell you the story of how we ended up here but for now I will just share that we have put almost 3 years of blood, sweat and tears (literally – everything here has a thorn or a spike) into our spread. I know it is only two acres but there are days when it feels like 200. Finally, with the warm weather and long weekend, we were able to spend four straight days working outside; which is also why it has been a few days since I posted. It was warm and sunny and wonderful. 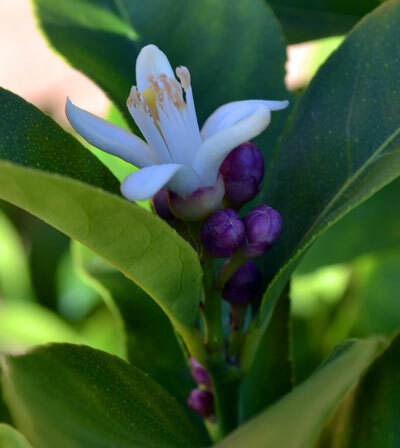 We planted a couple of new citrus trees and did a lot of pruning, clean-up and fertilizing and started working on our outdoor kitchen. We still have a lot to do but I am happy to report that everything seems to be showing signs of life – everything except my beloved Hibiscus but I haven’t given up or lost hope yet. 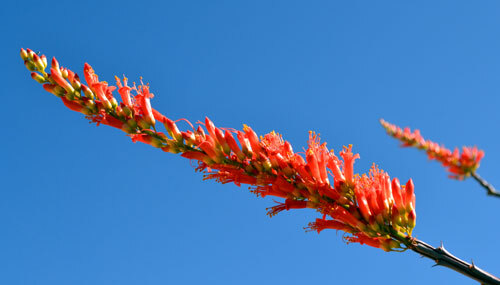 The tall spiky branches of the Ocotillo are covered in green. 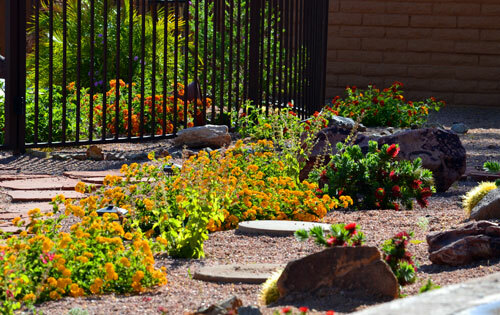 The landscape plants are starting to bloom. 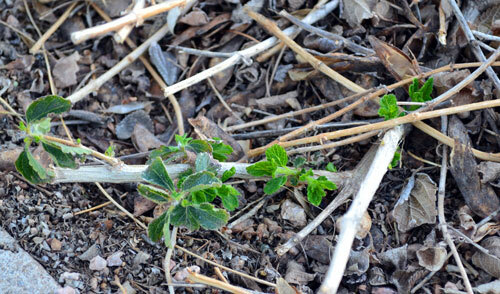 The Lantana, which was hit hard, is starting to show signs of life and recovery. 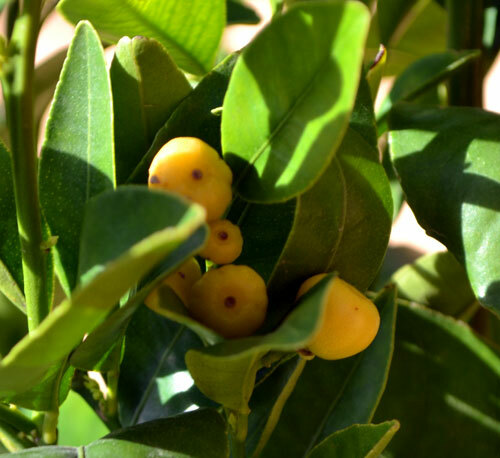 and Meyer lemons, navel oranges, limes, grapefruit and fresh herbs (the full vegetable garden is in the works for next year). found happily sunning himself stretched out on the back patio. I have come to an understanding with his kind. As long as they don’t have a rattle or venom of any sort, stay outside – let me repeat that STAY OUTSIDE, don’t startle me, don’t end up in the pool either dead or requiring rescue, don’t hiss at or threaten me or camouflage themselves in such a way as to startle me when I don’t see them, we are able to live in harmony or at least in tolerance. 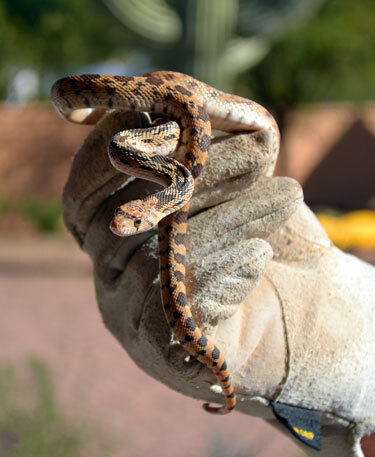 The rest of my family thinks these gopher snakes (who are around 5′ long when fully grown) are cool, awesome and “soooo cute” as Nathan says. As for me, I am just happy they don’t have fangs and a rattle. So, now that Spring is officially upon us, I will be outside, A LOT, happily playing in the dirt. I may be absent from the blogosphere a day or two, here or there, but I promise I will be back with more stories of the land, the house, the family, the food and the savior that I love. Come back for a visit tomorrow – I have a confession to make. 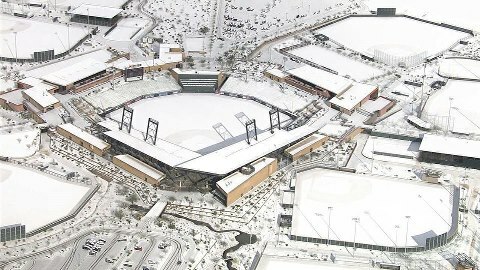 Ariel view, taken today, of the ball fields where “spring” training starts next week. 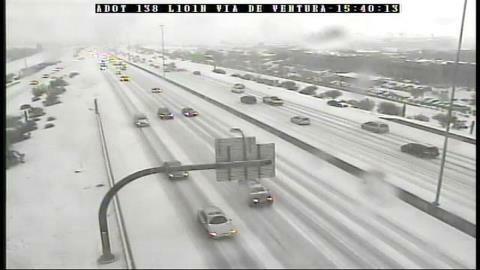 A view of the Loop 101 Freeway in Scottsdale, taken today. In this part of Arizona, we do not get snow. Not ever. Okay, once in a million years and today. I may be an optomist but it is a good thing I’m not a weatherman. This entry was posted in Isn't Life Funny?, Life in the Sonoran Desert, Photography, The Brewer Nature Preserve, Welcome Company, Welcome to my Garden, Welcome to my Hacienda, Workin' the Land and tagged Citrus Trees, Figs, Fruit Trees, Gardening, Lemons, Oranges, Peaches, Snakes, Sonoran Desert, Spring on February 20, 2013 by Welcome Company with Danielle. Pesto – the reason God made basil! 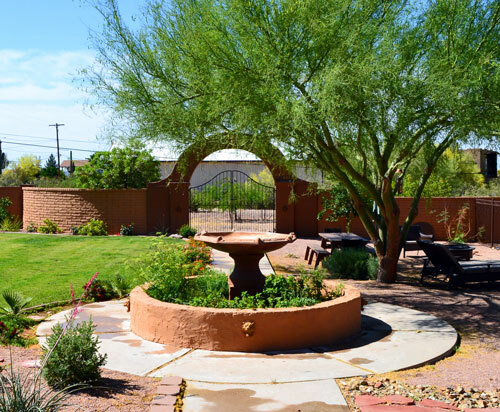 Even in Arizona, it is starting to cool off … finally! The kids are still swimming – because they are crazy little people who won’t admit they are cold even when their lips are blue and their teeth are chattering – but even so, it won’t be long before my basil is done for the season. So, last weekend David and I harvested most of the basil in my herb garden and made 6 batches of pesto. I love pesto. I could eat pesto on anything, even ice cream (well that might be an exaggeration but not by much). My favorite pesto recipe comes from one of my favorite foodies, Ina Garten – The Barefoot Contessa. I was very excited to share this amazing recipe with you so that you could make your own pesto and be fulfilled and happy. Did you catch the “I was” part? Surely, it would be okay to share another’s recipe if you give them full credit, right? Somewhere in the back of my head that little voice was saying “you’d better check before you do it” – look before I leap, what? Okay, just this once though. As it turns out, I learned two things; 1. it IS NOT okay to post another person’s recipe, even if you give them credit and 2. apparently I should listen to that little voice in the back of my head more often. I am very disappointed by this (actually, by both of these). I get it but I am bummed because I have made some really great recipes that are not my own. The good news is that I have also made some really great recipes that are mine, or at least my family’s, that I can and will share. I will also still share some of my other favorites and will point you in the direction of finding the recipe for yourself. So the moral of this story is “look before you leap” (why is that so often the moral of the story), “give credit where credit is due” and buy Ina’s cookbook because as far as I’m concerned it is impossible to have too many cookbooks or too much Pesto. This entry was posted in A Few of my Favorite Things, My Favorite Recipies, Welcome Company, Welcome to my Garden, Welcome to My Kitchen, Workin' the Land and tagged cooking, food, pesto, recipes on October 20, 2012 by Welcome Company with Danielle.